Computers/laptops were cited by 89% of respondents as the how they watch live-streaming sports, well ahead of tablets, cited by 27%. 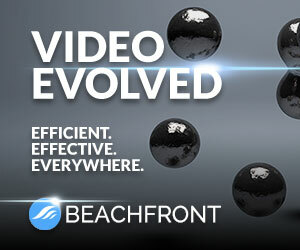 Across all types of sports video, computers/laptops were cited by between 78% and 89% of those who watch sports video as their primary way to access content. 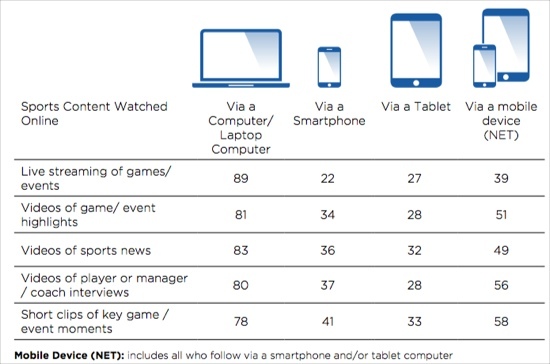 However, smartphones and tablets register most strongly for watching short clips of key game/event moments (cited by 58% of respondents). Time spent watching sports on computers/laptops was flat vs. 2013 at 1.7 hours per week, followed by watching on mobile devices at 1.5 hours per week (actually down from 1.8 hours in 2013). Aside from online, TV remains by far the most popular way to watch sports, with 96% of fans citing it as an activity, averaging 3.3 hours per week (slightly down from 3.8 hours in 2013). Some other data points that were interesting: 42% of fans consume sports content via a mobile device, 45% of fans use a second screen device while watching sports on TV, 19% of social fans share short clips of games on social networks and the most popular social networks to follow sports are Facebook (70%), YouTube (40%), Twitter (24%) and Google+ (16%).